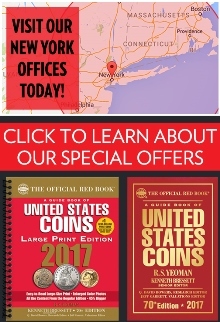 The Palmyra National Bank Of Palmyra in New Jersey printed $157,270 dollars worth of national currency. That is a small output. National bank notes from here should be scarce. This national bank opened in 1920 and stopped printing money in 1934, which equals a 15 year printing period. That is actually quite brief in terms of bank existence. During its life, The Palmyra National Bank Of Palmyra issued 9 different types and denominations of national currency. We have examples of the types listed below. Your bank note should look similar. Just the bank name will be different. For the record, The Palmyra National Bank Of Palmyra was located in Burlington County. It was assigned charter number 11793. 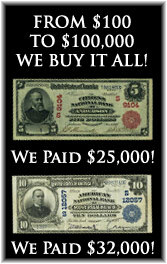 The Palmyra National Bank Of Palmyra in New Jersey printed 2,125 sheets of $5 1902 blue seal national bank notes. Most banks that printed such a small number of blue seal bank notes fall into the rare bank category. Ben Harrison is on the front of all 1902 $5 blue seal bank notes. This happens to be the smallest denomination issued for the 1902 series. Each note is complete with a blue seal and blue charter number. Despite saying series of 1902, these were actually issued by national banks between 1908 and 1928. There are two different types of blue seals. The first type is called a date back and it has “1902-1908” written on the back of the bill. The other type is called a plain back; it does not have the date stamps on the back of the bill. The values for these notes range widely based on condition and the bank of issue. The Palmyra National Bank Of Palmyra printed 1,449 sheets of $10 1902 blue seal national bank notes. Most banks that printed such a small number of blue seal bank notes fall into the rare bank category. 1902 $10 blue seal bank notes all have a portrait of William McKinley on them. Values can range from as little as $40 up to over $10,000. There really is no trick to know what is rare and what is common by just doing an internet search. You really need to work with an expert (like us) in order to determine the value of your specific bank note. There are at least ten different factors than can make some 1902 $10 blue seals worth more than others. We know exactly what to look for and we would be happy to provide a free appraisal and our best offer. The Palmyra National Bank Of Palmyra also printed 1,449 sheets of $20 1902 blue seal national bank notes. The same rarity rules for 1902 $10 blue seals also apply to $20 blue seals. Just remember that $20 bills are by nature three times rarer (unfortunately they don’t command a premium over other denominations). Hugh McCulloch is pictured on the front of each bill. Contact us if you need pricing help. The Palmyra National Bank Of Palmyra also printed 508 sheets of Type1 1929 $5 national bank notes. This is a small print range, but it does not guarantee rarity. Every 1929 $5 bill has a portrait of Abraham Lincoln on it. This is also the lowest denomination of small size national currency that any bank issued. All serial numbers end with the letter A and start with a letter between A and F. Remember that you can take the total number of sheets printed and multiply it by six get to the actual number of bank notes printed for this denomination. All small size national bank notes were printed on sheets of six. The Palmyra National Bank Of Palmyra also printed 244 sheets of Type1 1929 $10 national bank notes. That may sound like a very small number, and it is. However, when it comes to small size notes, that print range usually allows for a handful of survivors. Each $10 bill from 1929 has a portrait of Alexander Hamilton on it. The black number written vertically is the charter number. The charter number never affects the value; it is just an identifier. The ten dollar type1 national bank note happens to be the single most common national bank note, with over 65,000 known to exist from all banks. Of course each note is valued based on its condition and rarity. Some are very rare. The Palmyra National Bank Of Palmyra also printed 82 sheets of Type1 1929 $20 national bank notes. That is an extremely small sheet printing number. Survivors are still likely but definitely not guaranteed. Andrew Jackson is featured on the front of each 1929 $20 bill. Be sure to take note of the serial number on your specific bank note. If it is 000001 then you can expect a nice premium. There is a special market for serial number one bank notes. Of course, even if the number isn’t #1, it could still be collectible and have a high value just based on its condition and rarity alone. The Palmyra National Bank Of Palmyra also printed 254 individual notes from the type2 1929 $5 national bank note series. Type2 1929 national bank notes are already rare to begin with. A printing of less than 1,000 is especially low. This was an easy and popular denomination for national banks. 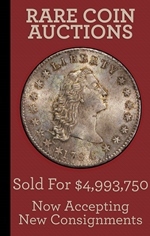 Five dollars could buy a lot of different things back in 1929 and the early 1930s. 1929 type2 five dollar bank notes are available in quantities today. However, some notes can be extremely rare. The exact value all depends on the bank of issue and condition. Contact us and we would be happy to give a free appraisal. The Palmyra National Bank Of Palmyra also printed 103 individual notes from the type2 1929 $10 national bank note series. Type2 1929 national bank notes are already rare to begin with. A printing of less than 1,000 is especially low. The easiest way to spot the difference between type1 1929 $10 bills and 1929 type2 $10 bills is in the serial number. Type2 notes have a serial number that ends with a number. 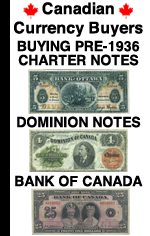 1929 type1 notes have a serial number that ends with the letter A. Generally speaking, these $10 bills are rarer than the earlier type1 issues. However, most collectors don’t pay more for that rarity because they look basically the same. The Palmyra National Bank Of Palmyra also printed 15 individual notes from the type2 1929 $20 national bank note series. Type2 1929 national bank notes are already rare to begin with. A printing of less than 1,000 is especially low. One of the great things about 1929 type2 $20 national bank notes is that they really aren’t that old and some can be extremely rare. Until the big head $20 series started there really wasn’t much difference between something printed in 1929 and the same bill printed in 1993. We have bought some examples in the past few months that people just found in their change.